All you do to ride for free is tap your Summer of Fun pass on the Q Box to pay for your trip. The Q Box is located at the front of the bus, next to the operator, and on all METRORail platforms. 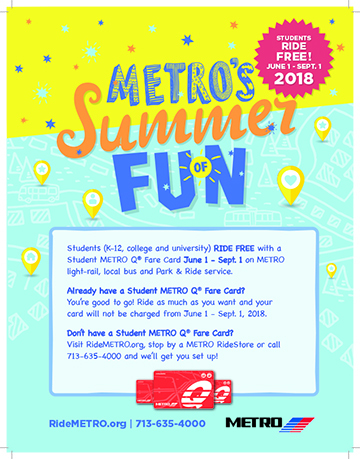 The Summer of Fun pass is a unique version of the Student METRO Q® Fare Card, and you use it the same way. The only difference is that your Summer of Fun pass is programmed to provide FREE rides until Sept. 1, 2018. The card then reverts to a standard Student METRO Q® Fare Card, requiring you to pay for all future trips. You then load money on the card and ride for half price. METRO requires all Summer of Fun pass users to register their card before using it. If your pass is lost or stolen, METRO will provide one FREE replacement pass – all future replacements will require a fee of $10.